There are other types of neutral (dame) points including: protective moves (teire) against the cut when outside liberties are filled; capturing stones in seki, etc. Either player can play first, with the same result. may be a ko threat. At the dame stage, an immediate is a protective play. 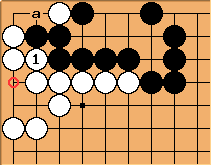 If White is komaster Black will not play . If Black is komaster the miai value is 0.44 (4/9) and the original count is -0.55. White has 1/3 point equity in the stone. We may think of it as 1/3 captured. HolIgor: This move together with the one above should give a point, shouldn't it? 1 and 2 are miai points. , preventing the ko, would also be worth 0.33. 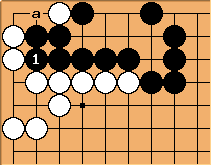 Bill: When White is komaster the play is in the indicated ko, with a gain of 1/3. When Black is komaster the play is in the throw-in ko, with a gain of 1/2. Matti: Let's first have thee copies. In copies 2 and 3 white has 2 5/6 points. Now, let's assume that we had 18 copies of the original position and have now 6 positions of copy one. As shown above white has 5 points in six positions in the corner. In one position of the six he has one point at the edge and in five others two points at the edge, total of 16 points in six positions, thus 2 2/3 points. So black has gained 1 + 2 5/6 - 2 2/3 = 7/6 from total of three kos. One ko is thus worth 7/18 points. Bill: I believe that the final position in copy one is significantly different from the position above with a miai value of 1/6. In 3 copies of that position White has 7 2/3 points on average (not counting the stone already captured in the ko), 23 points in 9 copies. Since White in one move can get 3 points per copy, we have a miai value of 4/9, which is the same as we get in a neutral threat environment. Since 4/9 > 7/18, we cannot stop in the "final" position in copy 1. Besides which, it is not clear when to play on the 2-1 point, or whether it is better than taking or filling the original ko. After the corner is worth -2. 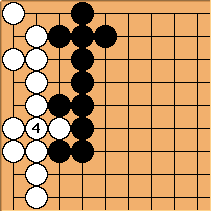 White has captured 3 Black stones, but Black can claim the stone. After White gets 2 Black stones plus 1 point of territory. Next Black can fill at in sente. Now there is a 0.33 point play at a. Now there is a 0.5 point play at a. The swing is 1 point at plus 0.5 - 0.33 = 0.17 in the corner in gote. That yields a miai value of 0.58. If B were komonster, it would be 0.75. The initial position has a local count of 2 5/6. The result after has a local count of 3 2/3. gains 5/6 of a point. The local score after - is 2. The hane-and-connect gains 5/6 of a point. Take stone in sente, leaving 0.67 point play. Save stone, leaving 0.5 point play. For higher values see /1.00 to 1.99, /2.00 and more. 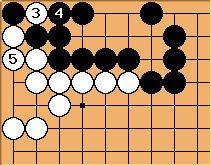 where Black has in effect 0.33. Bill: This is an ambiguous position. 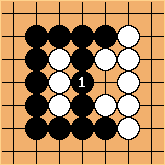 Its miai value is 1/3, but Black can take one stone and threaten to connect with sente. 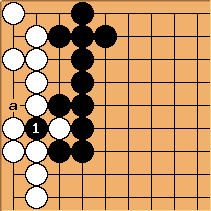 Then, OC, the position still has a miai value of 1/3, and Black's sente has gained nothing locally. (It may have been a ko threat.) In thermographic terms, it has a blue mast up to temperature 1 2/3.